Four-year-old children have been coming home from London schools with a book about the lives of a homosexual couple and their son. 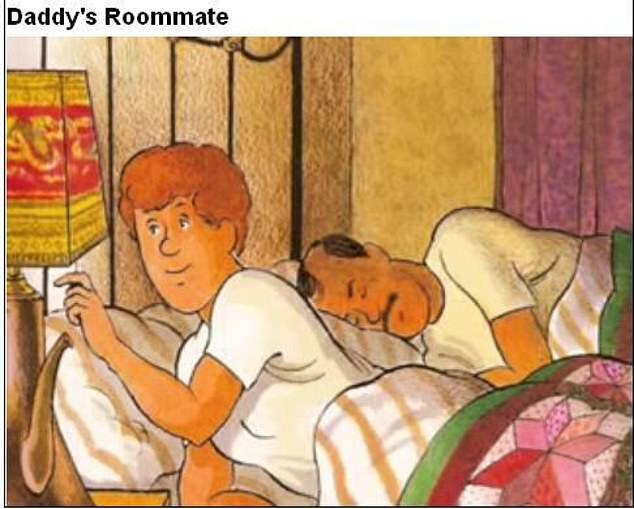 The book, called Daddy’s Roommate, includes everyday scenes of the men shaving together in their underwear and lying in bed. The parents involved meet together in a children’s support group in Hounslow, West London and say that their only objection is the children’s age. The row echoes a similar one in Birmingham where an estimated 600 Muslim children were withdrawn from a school in protest against lessons about homosexuality and gender equality. The parents all refused to be named or photographed and they claim that Daddy’s Roommate borders on indoctrination, teaching a practice they say their religion forbids. One father compared Daddy’s Roomate to giving a child a book featuring smoking, gun use, or even terrorism. He said: ‘The topic today is why the children are being influenced? ‘Just for the sake of LGBT rights – the vast majority of people who just want to live a normal life. ‘And a normal life is – outside any faith or any religion – normal life is to have a family, husband, wife, children, living in a family, without any influence on the children from an education they don’t need. Quite so. And isn’t it time for Christian parents to find their courage and to stand with these sensible and decent Muslims for the protection of ALL children from the sinister brainwashing agenda of the LGBTQ+ lobby and their cultural Marxist allies?